That call updates JComponent/Container childs placement and have to be called whenever you change them (when you add/remove components). I also recommend you to not call “add” directly on the frame – use the container returned by “getContentPane()” method instead. I have created my own Component UI for showing home screen image, but when frame loads I need to repaint my component using component resize listener. What should be the probable solution. I haven’t checked this issue with other look and feel because i have used components from WebLnF, But previously It worked for me with nimbus and metal look and feel. good job broo, thanks !. It’s good. I have a question. How to remove patch line if draw once? You can either drag the side line of the patch to make it smaller or hold right mouse button under the patch and drag it – that will remove patch from every pixel you have moved with mouse. Thank you so much!! It’s really convenient to use, a big help for rookies like me!! NinePatchEditor is awesome, thank you, looking forward the new version fix file chooser! Fix with file chooser will be first. After that i will add some more features into the editor itself. thanks so much for this great work! ! ! It looks great, but unfortunately it doesn’t seem to work on mac os. The file chooser allows you to select .png files, but the ‘choose’ button never becomes enabled, so you cant open an image. There also seems to be some other weird things going on with the file chooser – folder icons are rotated 90 degrees! and sometimes no file or folder icons appear at all. Finally for some reason you can multi select files and folders. All problems with file chooser are known and will be fixed in its new implementation. Multiselection will still be available if you choose it as a selection mode. And folder icons aren’t rotated – they just look a bit different from what you usually see on Mac OS X.
I will also check other features on a notebook with Mac OS and see if any other problems exist. This editor is awesome! I don’t bother using any other one even the editor that came with the Android SDK. Feature request: Sometimes I have to do a lot of images that are the exact same size and it would be awesome if the editor saved the positions of the nine-patch lines when I load a new image. Thanks for making such an awesome editor! Newer version will have some more features to work with multiply images but right now you can simply copy-paste the patches into newly opened image to avoid creating them again. Appreciated for such amazing tool. 1. It will be more convenient to provide some shortcuts to accelerate the operation. 2. Can move the entire image while pressing the mouse button in special mode. 3. Provide a color list or color wheel after clicking the drop-down menu to change the previous background without press any button. Pop up the color chooser dialog and then choose color, click the reject or confirm button need more actions. 1. Which operations exactly you want to have shortcuts? Maybe some additional ones? 3. That is a good point, i will modify the color chooser so it will be opened in a simple drop-down popup that doesn’t require any additional actions to close/accept. Such as change the patch size: move the mouse over the line, press the mouse button to select the line and move the mouse to move the line. Maybe shortcut for that: press ctrl + 1 select the vertical left line, press right arrow key to move the line right towards and press left arrow key to move the line left towards. ctrl + 2 to select the vertical right line. ctrl + 3 to select the horizontal top line. ctrl + 4 to select the horizontal bottom line. I think using shortcuts will make the operation more easy and precise. 2. Move the image(really not move the image, I think it should be move the view of the image): when zoom in the image to larger the scrollbar will appear. Over the image press the left mouse button and move left as the same to move the scrollbar right instead changing any pixel data of the image, ^_^. In my opinion drag the image is easier than move the scrollbar. 1. I will think of the best way how left/right/up/down hotkeys can be used to provide precise patch movement and might add that in newer version. Thank you, very useful tool, saved me a lot of time. I especially liked the patch copy/paste function. If I may have a suggestion, it would be useful to be able to refresh the file list within the editor (every time I created a new image in another software, I had to restart the editor). Refresh will be available with next editor changes. There will be a lot of them actually, just need some time to finish the work. You really rock man, thanks for creating this tool for free. what is the highlighted portion which formed as a result of intersection of patches ? Blue area is formed by content patches and displays the area of the image that will have any content in it in the patched component (for example text and icon in the button will be placed there). 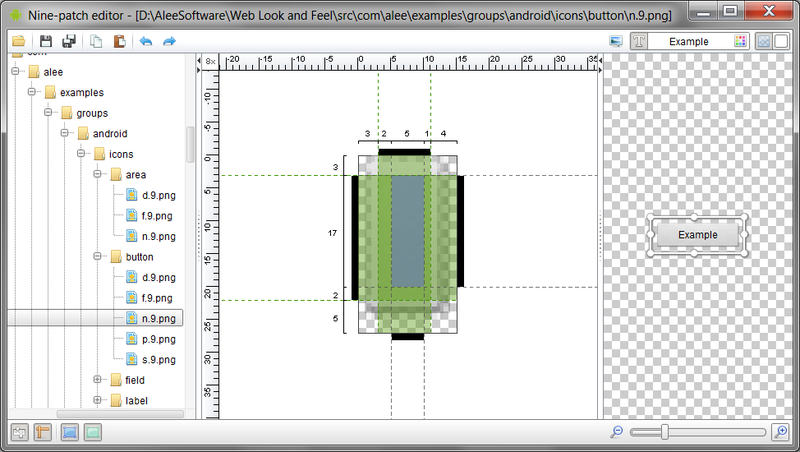 Green area displays image areas that will be stretched when component size is larger or smaller than the image itself. awesome tool!! Thanks! Keep your good work ! Now I’m working on the messenger app and spent whole evening trying to make symmetric 9-patch for message bubble. With this app I did just in a few seconds (rulers rules!). Thank you very much, you definitely must to write to Android team with proposal to bundle you app instead of default! Thank you so much, this app save my time! Keep your good work ! Just wanted to say thanks for the 9 patch editor. Couldn’t figure out the SDK version for the life of me. This one is simple to use and the preview area is amazing. There is still a lot of things to simplify nine-patch editing.